According to new research, when olestra was rolled out years ago, the entire nation was essentially being told that eating Kalteen bars makes you lose weight. Yeah, well, now the food industry is totally going in our Burn Book! The study used laboratory rats that were fed either a high-fat or low-fat diet of chow. Half of the rats in each group also were fed Pringles potato chips that are high in fat and calories. The remaining rats in each group were fed high-calorie Pringles chips on some days and low-calorie Pringles Light chips on other days. Rats who had a high-fat diet and dined on both types of Pringles ate more and gained more weight than those who had only regular clips. The rats who had consumed olestra also didn't lose excess weight, even when the potato chips were taken away. Rats on the naturally low-fat diet didn't gain much weight regardless of what type of Pringles they ate. The body knows that sweet and fatty foods are usually accompanied by a large amount of calories, and this triggers various hormone secretions and metabolic reactions. Throwing a fat substitute into that process just leads to confusion. Yet the revelation that Pringles Light aren't helping anyone slim down probably won't hurt sales. Previous studied have shown a similar effect with artificial sweeteners, and we still have our choice of Equal or Splenda wherever we go. And as we discussed earlier, low-fat diets persist even though they aren't really that good for you. Lead researcher Susan E. Swithers, PhD says that if you're trying to lose weight, "Eating food that's naturally low in fat and calories may be a better route than relying on fat substitutes or artificial sweeteners." That may be sensible, but it also sounds like it requires effort. 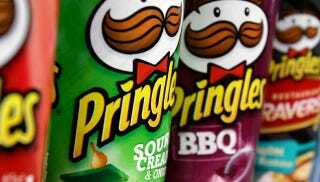 Food companies know that many people are just going to buy Pringles Light rather than working out what items are actually the healthiest.